Before JavaOne 2016 conference there will be available new release, but currently development focus is on properly and easy to use working usage of Robo4j. Robo4j Client module is basically based on agents. One of those agent is responsible for the system configuration. By calling this service the agent responsible for the Brick configuration (configuraiton agent) broadcast the brick setup to the agent responsible for the web page generation (web agent). Web agent is calling internal services to properly generate simple view as an HTML output. For the HTML output is used Robo4j templating service. User has any time an overview how the Robot was created. This service is intended to allow in the future full dynamic system reconfiguration. 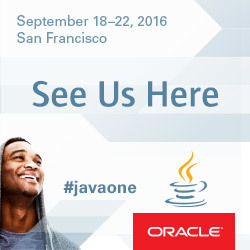 Robo4j.io proudly announces that it takes a 2 hours long slot at JavaOne4Kids as part of JavaOne conference. It's great step for the robotics framework to prove its simplicit in building robotic system. The Robo4j.io framework currently offers for Lego EV3 the RESTlike API and RMI API. Those APIs allow to access Lego EV3 Brick hardware which will be the core of the Robot. But such functionality is not all what Robo4j framework offers. 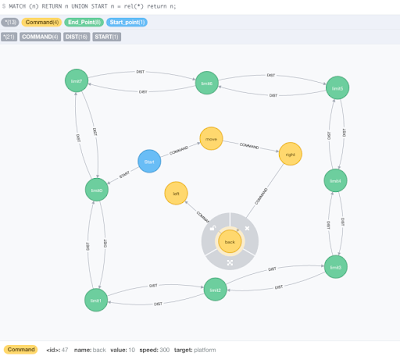 Beside the APIs Robo4j allows to the connection with Graph Database Neo4j and other databases are coming to be supported soon, such as SQL, NoSQL and etc. 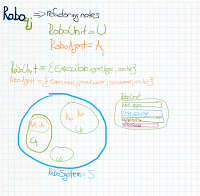 The Robo4j team is currently working on session details. 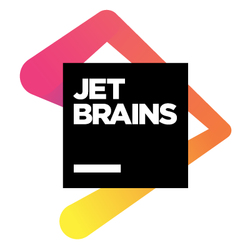 The main goal is to introduce Robo4j.io framework as the solid upcoming fully capable framework for Internet Of Things like systems develoment. Recently robo4j.io project got couple of new modules. One of them is the 1st database module. It's the connector with Neo4j database. None of those modules is currently available on github due to lack of time and ongoing development process. But here are few fact about the new robo4j-neo4j module. Example of the robot data visualization is on the picture above. 1. The Green points represent the limits of the space where the robot is currently located. 2. The Blue point is the Start Robot location which is inside the defined space. 3. The Yellow points represent the Robot movements, more precisely, the command which have been processed by the robot. 1. DIST represents the relation between the limit point. Limit points are created by the sonic sensor. As all around the robot can be scanned by sensors the Neo4j database will play the significant role in next step decision making. Let's see in of the next post how finding the shortest path performs. Robo4j framework has received new major update of the core logic and architecture. The small first taste has been already mention in previous blog post as simple sketch. 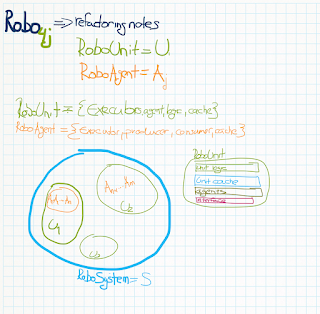 The sketch has pictured the relation between RoboUnits and RobotAgents. In simplified written words the RoboUnit contains the number of agents. 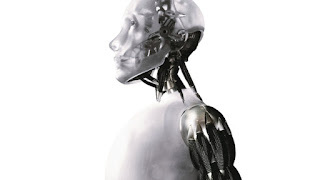 Those agents are interacting between each other and providing the result of the RoboUnit according to its assignment. Let's focused little bit on RoboAgents. RoboAgents behaviour can be simplified as the relation between Producers and Consumers. The Producers are basically providing result of the external inputs to the Consumers. External Producers inputs can be defined by Sensors or the result of the external computation/process. On the other-hand Consumers are applying desired logic on such inputs. Consumers are allowed to use bounded resources, which are provided to the RoboUnit. Current Robo4j framework release contains 1st simple example of RoboUnit implementation by implementing Robo Front-Hand. The front-hand unit is located in the front part of the robot and it's able to carry small things. The Robo Front-hand consists from one engine and one touch sensor. This is enough to employ Producer Consumer scenario where the sensors provides appropriate data to the consumer which is represented by the engine. 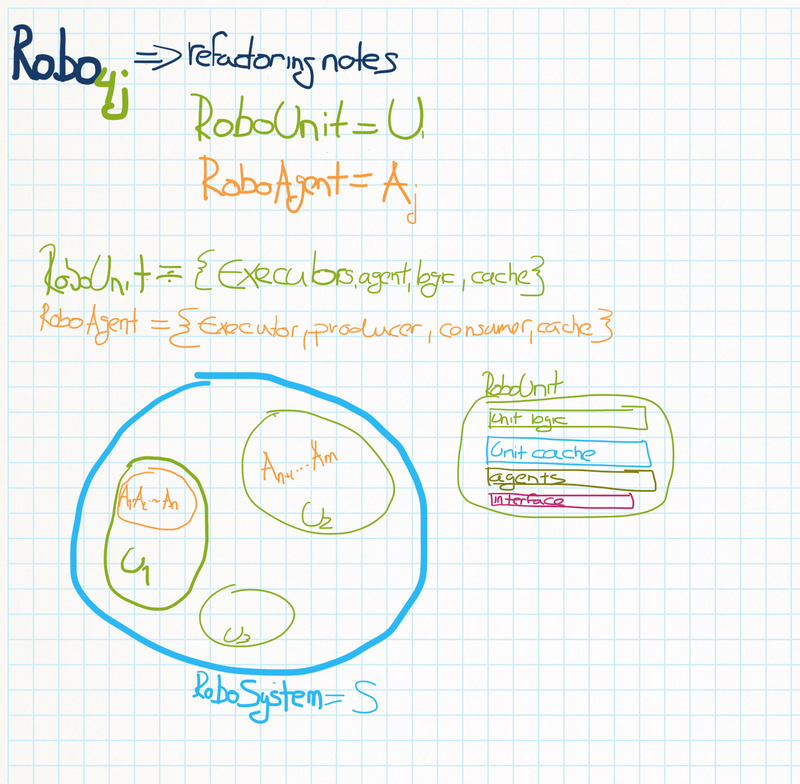 Following code has shown that RoboUnit consist from two agents one Producer and one Consumer. Producer is represented by TouchSensor and Consumer by Engine. The RoboUnit does accept two commands from outside as the input -> COMMAND and EXIT. These days is so much happening in robo4j project. The easies way how to express the most of changes is the attached image. Although robo4j system S has been already able partially reconfigure itself upcoming implementation offers massive improvements. 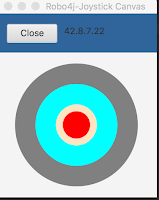 Together with robo4j-joystick demo, the update is coming of the main package is coming too. 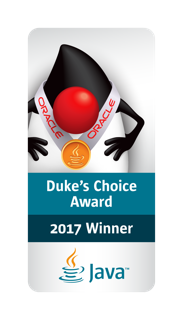 All main package changes are focused on improving the robo4j system configuration procedures, exception handling and agents. In the case of main package there will be soon published much more, including blog post. 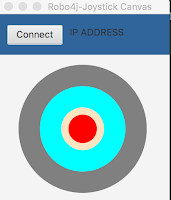 The robo4j-Joystick demo got improved the JavaFx UI interface with exception handling and information publishing. The communication between robot has be also improved. The current demo version provides the information about the robot connection state. 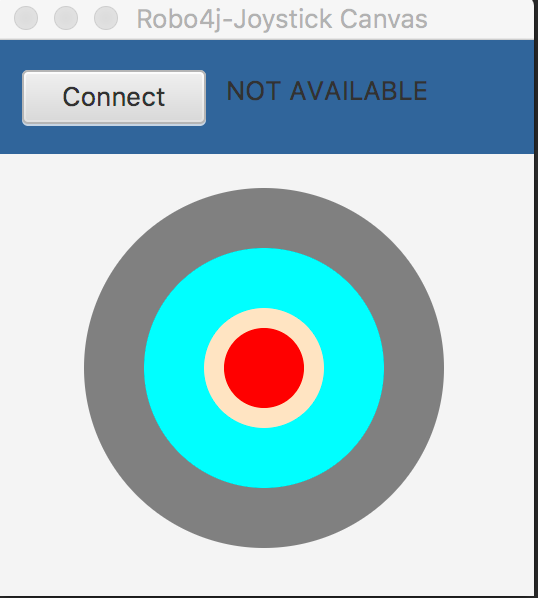 The Button provides two different states: Connect, Close. The Information about the connection procedure success is displayed aside in the connection label. Have a fun and Stay tuned! Few days ago I've mentioned an Idea of having Robo4j JavaFx Joystick to my friend @eppnikos . At that time he was seriously investigating JavaFx features. He completely open to take the challenge. 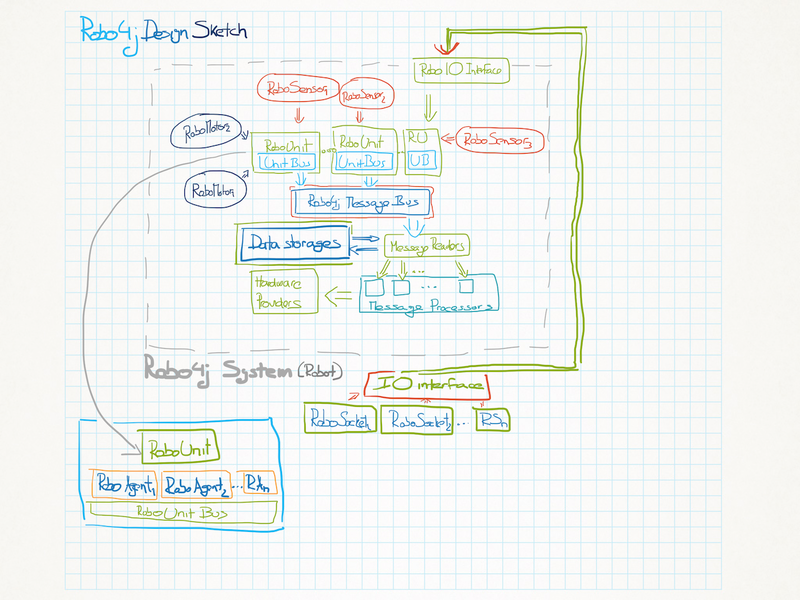 After few days he come up with base of Robo4j Java FX Joystick. I've connected the JavaFx app with Robo4j and pretty cool demo is born. What is Robo4j JavaFx Joystick ? More detailed post will be released soon. Stay tuned and enjoy video! Robo4j is alive! May the force be with it! The 1st robo4j brick-client POST request version has been using JSON field "command". There was not implemented support for JSON Arrays. Old POST command has also any type of response. The robo4j socket has been only closed. Robo4j alfa-0.2 release introduces POST request with JSON Arrays support. The new array field has name "commands". The new support of JSON Arrays will allow in upcoming future much better integration with 3rd party technologies. @miragemiko has written the short blog post with attached video. The video shows the stability of the robo4j-brick-client. 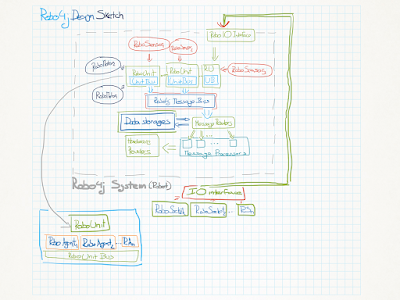 Robo4j framework has released update of its light-weight socket server. Update contains possibility to use cURL to command the robot directly. The small update contains also code changes according to the way how the incoming events/tasks are being processed. Enjoy and more is coming soon! This post is the second extension to the previous documentation post part1. Previously has been shown how to instruct the robot by commands over HTTP connection by using POST, GET request types. The following post will explain and introduce another services which are available in current robo4j alfa-0.2 release. Those services are provided by the robo4j-brick-client light-weight socket server. The socket server is responsible for handling HTTP requests. It is open on the port 8022. The running services also provide access to the robo4j AGENT. This agentis running on the brick. This specific AGENT implementation is currently responsible for cashing processed command requests. You can access it by using cURL or simply your favorite web browser. The robo4j-brick-client returns its current state with information which commands have been received. Such response provides information about command process state. The last service which is touch in this post is the EXIT service . By sending exit request to the robot the exit response is generated. The response is generated after all Executors are stopped and application process is ready to finish. Stay tuned and enjoy all news. The Robo4j alfa-0.2 release is another big step for Robo4.j framework. It contains 1st version of robo4-brick-client. The Robo4j brick-client is standalone module which uses native robot hardware. The module contains also stand alone server which is able to communicate with rest the of the word. The communication with the robo4j-brick-client uses JSON lightweight data-interchange format. 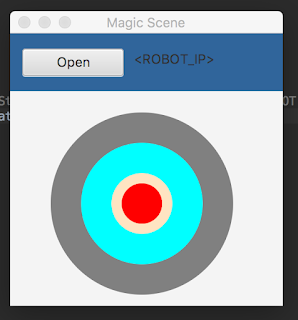 The current implementation allows to send basic robot platform orient commands. Such commands allow to process simple movements (move, back, right, left) with the Robo4j Alfa Robot unit. Before we go little more into the details it's worthwhile to mention that POST service is also available. The POST request will be in future preferred over the SSL communication layer. You've seen the main visible change in alfa-0.2 release. But it's not everything, the robot hardware specific apart has been move to the package robo4j-lego module and robo4j Agent structure has been improved. Robo4j alfa-0.2 also comes up with robo4j-commons which is the set of commonly used utils and features across the whole Robo4j project. Last visible improvement it Robo4j template engine PageParser. This engine is currently responsible for generation robo4j-line help and robo4j-brick-client web pages. Yesterday Robo4j.io has proudly announced new alfa-0.2 release. Robo4j alfa-0.2 release is successfully OUT ! Robo4j proudly announces successful alfa-0.2 release. The release is already available over the GitHub account but documentation is not ready at this moment. The documentation with all new features will be published in next days. Robo4j.io is also preparing some new videos. Robo4j framework currently offers the command-line interface. The command-line interface allows you to create your own commands and process them. Following post should get you little closer. To exit any of sections it's enough to type "exit" key word. Robo4j.io command-line module is designed for full interaction with the robot. to controll Robo4j.io Alfa robot. Every command-line section contains its own help to properly inform user how to interact within. The table contains the command name and robot command the will be processed after command has been typed. Save specific command by using predefined prefix. You can create new command for the robot and store it into system internal cache. new command format is JSON like. "run command line" :: robot command line allows you to command the robot. Great news! Promised release date has been achieved and source-code has been deployed on GitHub under GPL license version 3.
core functionality which provides communication with robot, synchronisation of asynchronous events and etc. To make the robot work it's necessary to follow previous blog post about how to build the robot. All configuration parts are then processed at initiation time of the Robo4j.io inside the entry point. This entry point is the the class ControlPad. Pictured configuration is pretty straight forward and more will be published soon! The first robo4j.io alfa release is planed to use LEGO Mindstorms EV3 build system. LEGO build system has been chosen because it allows build a robotic kind of device without any additional requirements. For accessing LEGO units will be used RMI (Remote Method Invocation) communication Java API as the easies option. 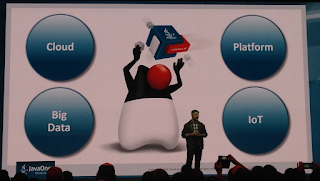 RMI allows access Java Object from another Virtual Machine. Another reason why LEGO Mindstorms EV3 has been chosen is the fact that at the beginning robo4j.io has been planed primary for LEGO usage only. 1st alfa release will not contain any advanced Machine-to-Machine (M2M) communication. Robo4j.io alfa release is meant to be kick-off of the whole project. There are already prepared bunch of features ready to deploy but everything has its time and they will be continually published in future. The winner of robot type competition for Robo4j.io alfa release is MODEL GRIPP3R. LEGO provides all instruction how to build this model over YouTube channel or over the PDF. Robo4j.io is preparing for the alfa-release (4.6.2016). Robo4j.io has currently updated the section About.